Enjoy your fresh cucumbers with this Mediterranean-inspired salad. With touches of dill and lemon, this recipe infuses your favorite, crunchy vegetables with intense flavor. Alongside a hummus pita pocket or meat kebab, this salad makes for a delicious and incredibly healthy side! In a small bowl, combine the red onion, olive oil, vinegar, and oregano, and let marinate at room temperature while preparing the rest of the salad. 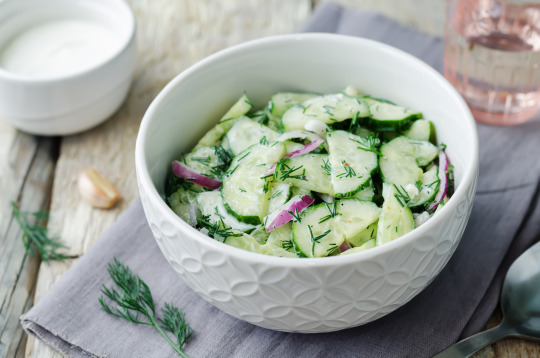 Place the sliced cucumbers into a large salad bowl. Then, in a separate bowl, combine the Greek yogurt, lemon juice, garlic, dill, salt, and black pepper. Add the yogurt mix and marinated onions to the cucumbers. Toss everything together, and taste test for additional seasonings. April 24, 2018 by Corinne L.